Timeless chic receptions coupled with the wow factor are very popular for 2017-2018. The Timeless Linen Collection Trend is perfect for the bride who wants to achieve a classic, sophisticated feel. The best part about the Timeless Collection is that the pricing is very economical linens. Our Timeless Linen Collection consists of Manhattans, Panama, Pintuck, and Satin. The Manhattan linen is a 100% Polyester Faux Dupioni (pictured above). This reversible textured fabric is dull on one side and shiny on the other, the most popular colors are ivory and beach. The Panama Linen is a Polyester Faux Linen. It’s plain texture adds a sense of simplicity to any event The brides are in LOVE with the White Panama Linen. 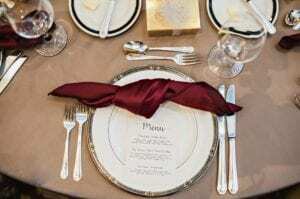 Pintucks create a bit of texture to the table without an over abundance of sheen in a taffeta sewn in a 4” diamond pattern. The most popular colors in pintuck to create the timeless look are white, ivory and cashmere. We are discovering that our brides want to create a clean look for the guest tables and strategically use a Metallic linen for the head and cake table. We are seeing the use of Copper and Rose Gold as accents in votive holders and charger plates. Check out our Rose Gold Charger in our Farm House Table Blog, it is stunning. For Centerpieces…..Green Green Green. Greenery Runners coupled with a bit of candle light bring the perfect ambiance to the timeless look. “Peonies, garden roses, ranunculus, dahlias and other “soft-petal” blooms are the top-requested flowers from coast to coast — and for good reason. “They epitomize romance,” says Zoe Gallina, creative director of Botanica international Floral Design in Florida. Peonies, in particular are in high demand, with one planner noting that some brides will time their weddings to take place when peonies are in peak season. Loose rose petals, used as a “garland” or runner atop tables or scattered among floating candles, are another trend that’s coming on strong.” Courtesy of http://bridalguide.com/planning/the-details/reception/wedding-trends-2017. © 2017| 2018 LUXE Event Linen. All Rights Reserved.